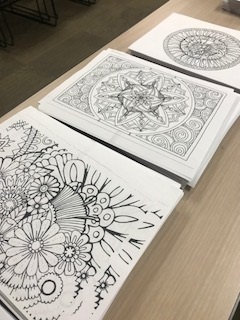 Art Kits that are readily available to those going through cancer treatments are one of the most visible elements of art therapy at the cancer center. 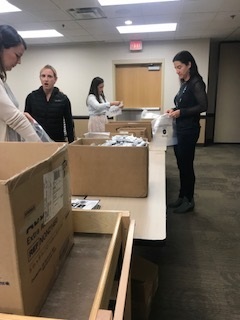 Our members recently spent time there putting the kits together. 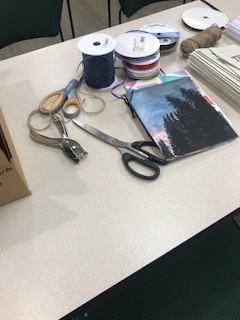 Take a look at the pictures below to see us in action and to view just some of the art supplies that come together to make the kits. Jenn McHale, Art Therapist at the cancer center assembled the various stations and our members got to work. There are six different kits offered to patients. 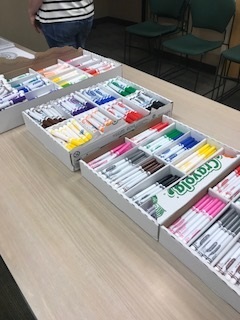 You will see a variety of art supplies within the kits, everything from clay and water colors, to markers and crayons. Each kit is designed to put the patient at ease and reduce anxiety. 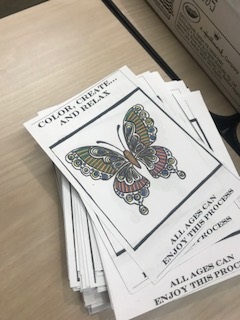 Jenn shares that the kit containing adult coloring pages, complete with markers, crayons or colored pencils is always a very popular option. She says she often shares those with family members and other visitors who are on hand to offer support a patient. Jenn explains that no matter what kit the patient chooses, the goal is for them to enjoy the creative process. 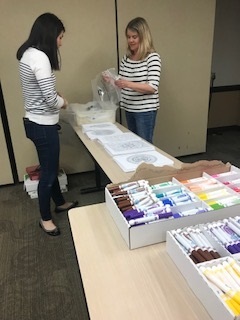 Our members assembled approximately 500 kits during our recent visit. Jenn shares that these should last roughly four to six months. Our members enjoyed coming together to spend time within the walls of the cancer center. This gathering, like all of our events, offers the chance to socialize and build friendships while making a difference in the lives of those battling cancer. 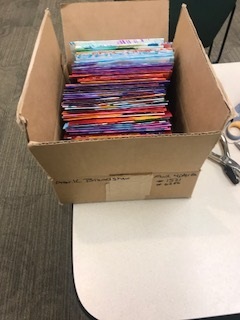 Suzanne Miller, a third year member of Kitchen Kapers values the hands-on volunteer opportunity, “assembling art kits for the Artist in Residence program is another way that we support patients facing the challenges of living with cancer. Working alongside fellow members, we are able to roll up our sleeves and make a meaningful impact." 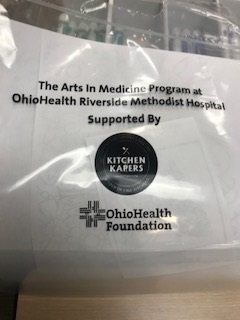 If you would like to support the Artist in Residence program, please consider making a donation to Kitchen Kapers. Also, mark your calendar for our annual tour of newly remodeled kitchens in the Upper Arlington area. This year’s tour will be held on September 9, 2018 from 12-5pm. Make a donation or purchase your tour day ticket on our website now!